Oil Water Separators – Innovative water treatment solutions for your business! Oakstown high-efficiency coalescence Oil Separators are fitted to surface water drainage systems for protection of the environment from oil pollution. Oakstown separators conform to the European standard EN 858 for the design and use of prefabricated oil separators. All separators fulfill European standards achieving results of oil removal much lower than 5 mg/L. BS EN 858 refers to two ‘classes’ of separator, based on performance under standard test conditions. Class 1 separators are designed to achieve a discharge concentration of less than 5 mg/litre of oil under standard test conditions. 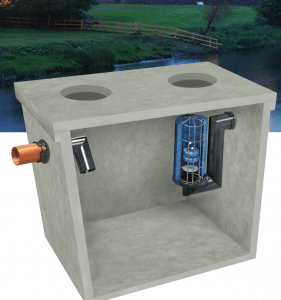 These separators are required for discharges to surface water drains and the water environment. Both classes can be produced as ‘full retention’, ‘bypass’ or ‘forecourt’ separators. The ‘full flow’ is normally equivalent to the flow generated by a rainfall intensity of 65 mm/hour. Full retention separators are used where there is a risk of regular contamination with oil and a foreseeable risk of significant spillages e.g. vehicle maintenance areas and retail fuel forecourts. 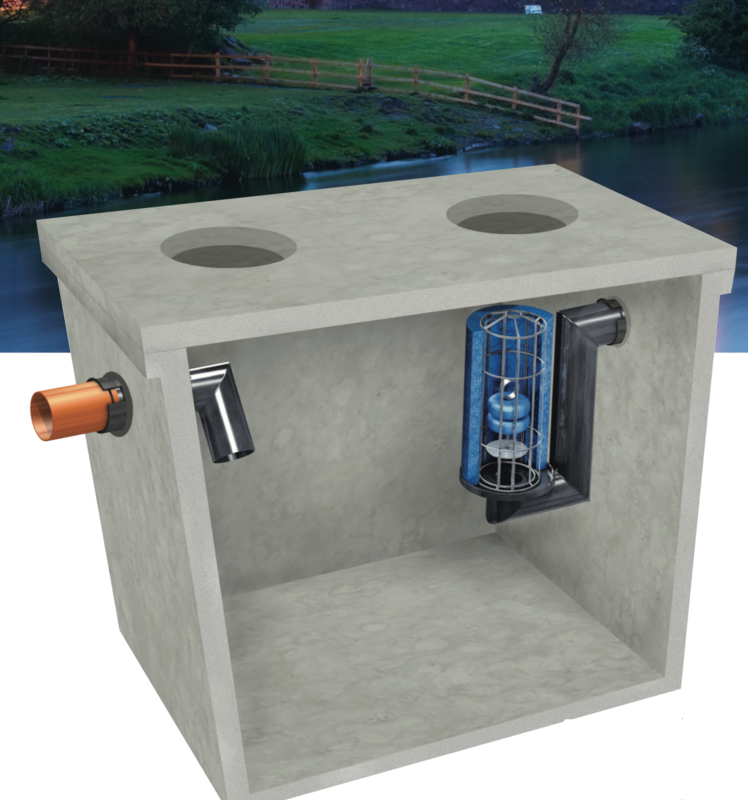 Bypass separators fully treat all flows, for the area served, generated by rainfall rates of up to 6.5 mm/hour. This covers most rainfall events. Flows above this rate are allowed to bypass the separator. These separators are used when it is considered an acceptable risk not to provide full treatment for high flows, e.g. where only small spillages can occur and the risk of spillage is small. In cases where a large spillage might occur, it is not acceptable to use a by-pass separator. The term ‘forecourt’ refers to all forms of liquid-fuel dispensing outlets, both retail and non-retail, including those where only diesel is dispensed. A forecourt separator must be a ‘full retention’ separator, large enough to serve the catchment area of the site and have a sufficient oil storage volume to retain any foreseeable spillages. On a forecourt where tanker deliveries are received, a separator with an oil storage capacity of 7,600 litres will meet the requirements of BS EN 858-2. Washdown separators are generally used in areas such as car wash/truck wash and various cleaning systems that discharge directly into a municipal treatment facility. Discharges from washdown separators must not be allowed to enter the surface water drainage system or a fuel/oil separator. The likely presence of emulsifiers such as detergents will disperse oils and will reduce the separation efficiency of all separators. • Our service also includes delivery to site and off- loading into position with truck mounted cranes. All Oakstown separators are certified to EN 858. Please note* Your contact details will be kept on file and may be used in order to contact you in the future to provide information on our products as a result of your query.